The perfect wedding day requires the perfect wedding venue! WIND + JAMES spacious event center provides the ideal canvas on which to paint the details of the most important day of your life. If you want a unique + memorable location, with unparallelled amenities, look no further than WIND + JAMES! Whether you are planning an intimate reception or a much larger affair (up to 299 guests), our flexible room configurations and styling options make our venue the perfect backdrop for your big day. Why settle for just another generic hotel ballroom, when you can host your event in an historic + one-of-a-kind building that will impress your guests, look great in photos, and create memories that will last a lifetime? Our vaulted 23 foot ceilings create an open + inviting space for your guests, that never feels crowded. 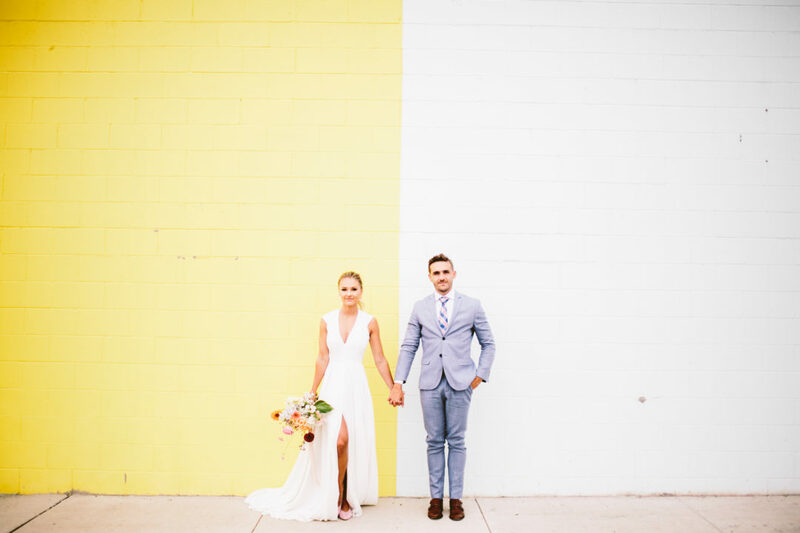 Whitewashed brick walls serve to complement every wedding style and theme, including: casual or country; modern or chic; urban or industrial; fairytale or whimsical; elegant or sophisticated, and much more. Vows can also be exchanged outdoors – or guests can mingle + enjoy cocktail hour – in our lovely, newly designed, open air courtyard. Our full, modern kitchen ensures your caterers have everything they need to serve drinks, hors d’oeuvres, meals and dessert. Your guests will love our ample, easy parking – or we can supply valet attendants. With our flexible + affordable wedding package options, you are always free to supply your own decor, beverages, food, entertainment and cake. Or, enlist our expert wedding planning staff to arrange every detail, including decorations, drinks, catering, entertainment and more. Whichever you choose, your wedding will be an event to remember when held in our stunning venue. Use the online scheduler below to make an appointment to discuss your wedding reception needs, schedule a tour, or to reserve your wedding date . . . and take the first step toward creating amazing + unforgettable wedding memories that will last a lifetime!